New Shepard is a fully reusable rocket system consisting of a capsule and a booster. The booster returns to land thanks to its rocket engine while the capsule is equipped with a parachute. The vehicle’s capabilities make it possible to place the capsule in a state of microgravity for three minutes, which should seduce not only tourists but also researchers. NASA has also expressed interest in sending some of its scientists to take advantage of the opportunity. Blue Origin focuses on the first manned flight of its New Shepard suborbital rocket. It successfully completed its tenth test flight on January 23rd. We don’t know yet when astronauts will board the capsule. Now that Virgin Galactic is able to take humans into space, Blue Origin has to demonstrate that it can do at least as well as its competitor. According to the leaders of Blue Origin, this first manned flight should take place in 2019. 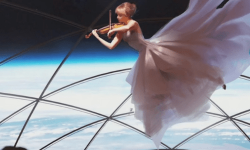 Since the early 2000s, space tourism has been expected to become a reality. Several companies compete with each other, but two of them have more advanced projects than the others. This is Blue Origin with its New Shepard rockets, and Virgin Galactic with its VSS Unity spacecraft. Both companies have conducted launch trials in recent days. Things seem to go well in one case as in the other. We can not wait to see which of the two companies will offer the first low-cost commercial space flight. The tickets will still be negotiated in the hundreds of thousands of dollars, but that is still a breakthrough compared to the millions of dollars that tourist space travel has cost so far, provided of course that you are satisfied with a suborbital flying experience. Blue Origin passed a test of its emergency separation system a few days ago. In case of problem on the rocket, the capsule is capable of activating thrusters to quickly move away from danger. It is a system found on virtually all manned space vehicles. On Wednesday, July 18th, Blue Origin let the New Shepard rocket carry its space capsule up to 74 kilometers. A few seconds after its separation, the space capsule triggered its escape engines, which allowed it to climb up to 120 km altitude. The booster then returned to upright with its engine B3, while the capsule is down parachute. Everything seems to have gone perfectly and so Blue Origin is recording another success. This allows to consider a first manned flight. But before affluent tourists can afford a dose of adrenaline, it is the test teams of Blue Origin that will occupy the first seats. A first manned test flight could take place this year. Blue Origin will then begin to market tickets for space. Last Sunday, Blue Origin conducted the first tests in 2018 of its New Shepard vehicle. This one reached an altitude of 107km in a flight that reproduced the parameters of a real mission. This flight was the 7th for the New Shepard ship. It was also the second to ship a payload in addition to its test hardware. NASA, three universities and one company were able to put their experience on board the capsule. The good progress of these tests paves the way for the first tests with crew at the end of this year. Blue Origin’s schedule places the company in a unique position: the New Shepard orbital rocket will be operational before New Glenn. In other words, Blue Origin wants to fly men before flying satellites. 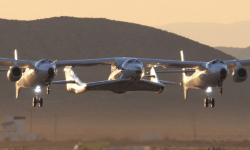 Although these are suborbital flights, Virgin Galactic has shown that they are not without risks. But we can be reassured by saying that the architecture of Blue Origin may offer more safeguards than that of its competitor: the capsules are equipped with a propulsion system for a rapid removal of the booster in case of problems . On December 12th, a New Shepard rocket flew away carrying with it a new version of the inhabited capsule called Crew Capsule 2.0. The flight went perfectly. New Shepard came back gently by retropropulsion while the capsule used parachutes for his return to Earth. The Crew Capsule 2.0 has some improvements over the previous version, including the addition of large windows, which is understandable when we remember that it is space tourism that Blue Origin is targeting with this launcher. Together, the New Shepard rocket and its capsule will take five passengers to a hundred kilometers altitude, so technically in space. To achieve this result, the small rocket has a single BE-3 engine that burns hydrogen and liquid oxygen for 110 seconds. New Shepard is equipped with four feet and 8 airbrakes to ensure a smooth return and therefore easy reuse. The flight only lasts about ten minutes. The costs and the number of potential customers will be decisive for Blue Origin to benefit from suborbital flights. NASA seems already interested: December 19, the US space agency has indeed announced that it planned to send scientists on such commercial flights to carry out experiments in microgravity but given the duration of the flight, a flight Zero G plane will be the same thing. To ensure commercial success of the capsule, safety must be foolproof. Spaceflight still has the image of a very hazardous activity. The slightest incident on a Blue Origin flight would certainly discourage many customers. The first manned flight with a test crew could take place this year. If successful, the first commercial flights will follow very quickly. Virgin Galactic is a serious contender for New Shepard. The date of the first flight of Richard Branson’s company is hard to define. The ticket price is $ 250,000. Blue Origin could offer an equivalent price or try to lower prices to conquer most of the market. Jeff Besos estimated the cost of each launch at $ 10,000. Blue Origin would therefore have a significant margin to attack its competitor on prices.